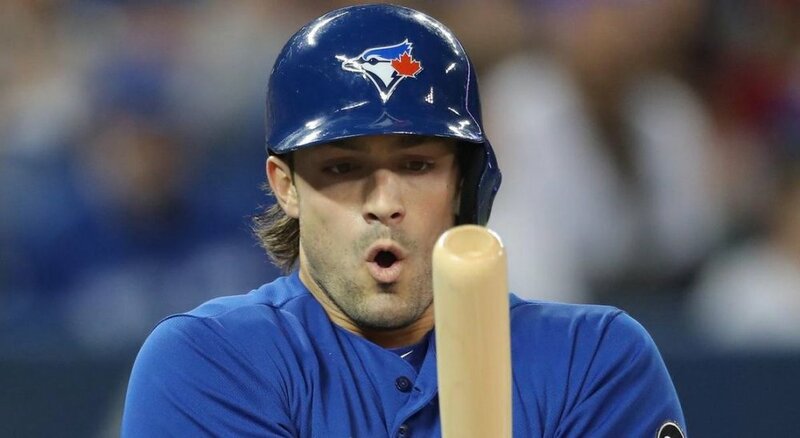 Through 9 games this season, the Blue Jays’ new right fielder - Randal Grichuk - has just 2 hits in 30 at-bats, for an average of .067. He has hit a home run, but overall, Grichuk has really struggled so far with the Jays. He was acquired this off-season from the Cardinals in exchange for Dominic Leone and Connor Greene, and the hope was that he’d be the starting right fielder in Toronto for at least the next few years. Like I mentioned, he’s really struggled so far with the Jays, so just how long of a leash should the Blue Jays give Grichuk before they make a change? That leash should be pretty long for him. First of all, there’s no way he will continue to struggle this much as the season goes on; he’s going to get it going soon. Also, the Blue Jays gave up some good pieces to get Grichuk, so you have to think the team will be patient with him. And while there are some good outfield options in the minor leagues like Teoscar Hernandez and Dwight Smith Jr., the Blue Jays wouldn’t have gone after Grichuk in the first place if they wanted either of those guys on the team this year. Grichuk is here to stay with the big club, and it’s only a matter of time before Blue Jays fans see what Grichuk can really bring on an everyday basis. Grichuk will strike out a lot this season. He had a 30.1% K rate last season, which is way above the league average of about 20%. But, with those strikeouts comes a lot of power from Grichuk, who from 2015 to last season, had an average exit velocity of 90.8 MPH, ranked 24th in the MLB. These numbers show the overall hit or miss factor you get with a guy like Grichuk. He can hit the ball as hard as anyone, but he often struggles to make contact, and that’s what Blue Jays fans are going to have to get used to when they watch Grichuk this year. As of right now, Grichuk has been moved to a lower spot in the batting order, and I like that move by John Gibbons since it helps take some pressure off of a guy who is definitely nervous coming to a new team and a new city. Once he starts to produce like he’s capable of, I could definitely see Grichuk hitting in the 5th or 6th spot in the order. For now, I think 7th if 8th in the order is perfect. Patience will be key for Blue Jays fans in this situation. Obviously we all want to see him excel out of the gate, but that doesn’t always happen, and it’s our duty as fans to be as patient as possible and wait for Grichuk to start producing.